Did you all survive Thanksgiving? Have you started your Christmas shopping? We went out Friday to pick up a few things and it was sooooo crazy. I figured it would be busy, but it was SO busy. That's okay though, because I scored some good deals. Now, I just want to relax and enjoy some warm biscuits covered in honey. Back in the day, my Grandma Parker loved to copy down recipes from T.V. I don't know if T.V. was different back then, but I am wondering how in the world did she write down all those ingredients so fast? I tried it the other day and thank goodness for my DVR. I had to click pause and rewind so many times and there weren't even that many ingredients to write down. Luckily I got them all right, because these Corn Biscuits turned out SO GOOD! They are crisp on the outside and moist on the inside. The cornmeal is soaked in buttermilk for 10 minutes, so your biscuits don't end up too grainy. The texture is perfect and the flavor is just right, not to sweet. 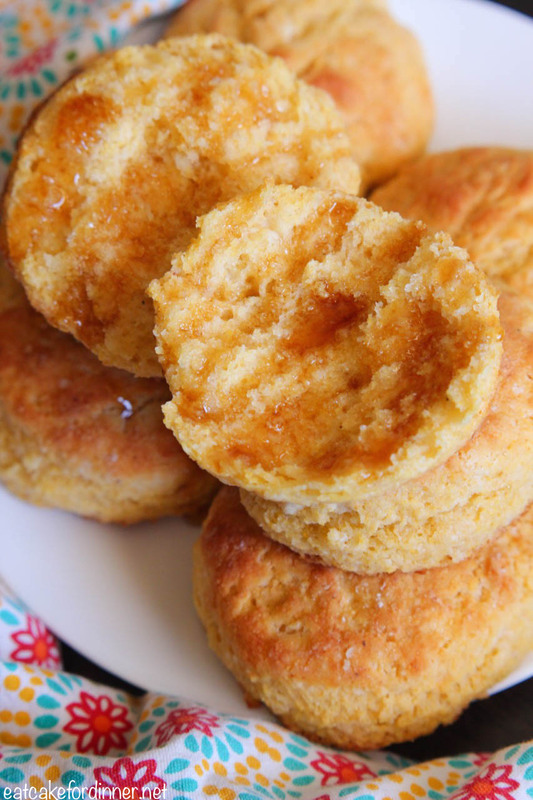 They taste like cornbread, but in biscuit form and when drizzled with honey, you might find yourself eating one too many. Whisk together the cornmeal, buttermilk and honey. Let rest for 10 minutes to soften the cornmeal. Add the flour, baking powder, baking soda and salt to a food processor. Add the cold cubed butter and pulse until it resembles coarse sand. If you don't have a food processor you can either use a pastry cutter or your hands to cut in the butter. Add the dry ingredients to the wet ingredients and fold together using a rubber scraper until no streaks of flour remain. Lightly flour board. Knead dough a few times and pat out into a 9'' circle, 3/4'' thick. Cut out biscuits using a 2 1/2'' cutter. Transfer biscuits to a parchment paper lined baking sheet. Bake at 450 degrees for 5 minutes, until they just start to rise. Lower temperature to 400 degrees and bake for 8-12 minutes or until golden and risen. Yield: 12 biscuits. Jenn's Notes: I added extra buttermilk, because the dough seemed a little dry and I ended up with a fairly sticky dough. I don't know if that is why my biscuits ended up so moist, but that is how I will make them from now on, because I loved them. 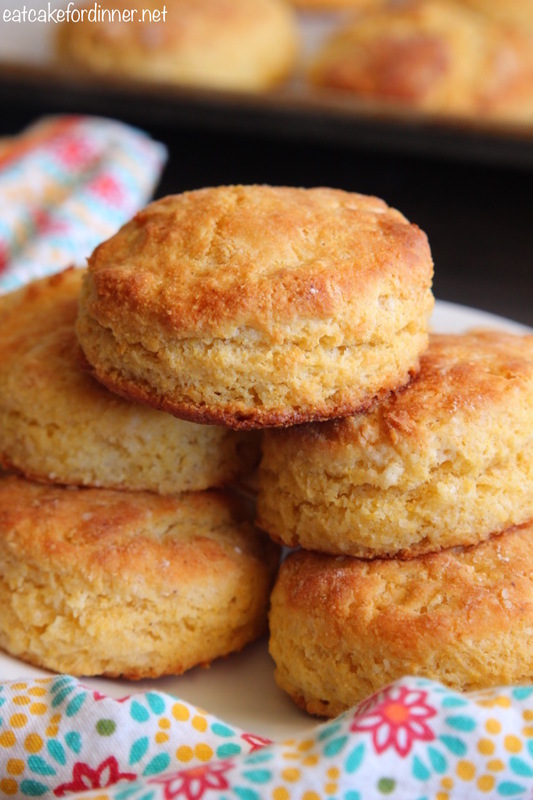 These biscuits look sooo flaky and delicious. Gotta give them a try too. Yes, my mom used to copy recipes from TV too (and I believe she still does.) :) Yes, thank God for the DVR. I sweat those look like the "cornbread" squares at ikea. I scoured the internet searching for a more cake like consistency for a corn-bread-biscuit type thing and here it is! YUM! Ok, I'll be trying these! Your pictures make them look so yummy! If time allows, I'll be making your Homemade snickers bars this weekend! LOOOOOVE Snickers...Hi, my name is Kristy and I'm addicted to snickers!!! Question, plz? I made your Grammy's White cake this afternoon and my icing did not come out white. It's a tan color, I'm assuming from the vanilla. It's delicious and the cake is wonderful but it's just not pretty like yours...:(. any help?? what kind of corn meal did you use? They look delicious!!! Wow these look great! Thanks so much for sharing at Mom On Timeout!